By Roger J. 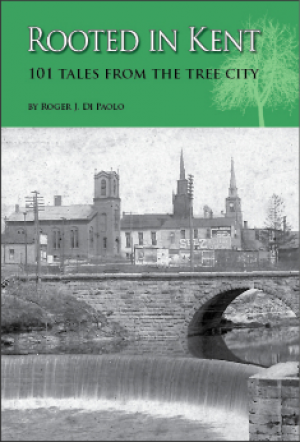 Di Paolo, 2009, 278 pages, 101 articles, 130 photos, index Kent Historical Society Press ISBN 9781607251750 Paperback Di Paolo is editor of the Kent-Ravenna Record-Courier where his "Portage Pathways" is a weekly local history feature. This collection of 101 columns includes tales of Kent's early history, business and industry, crimes and the growth of its educational institutions, including Kent State University, and profiles many of its most prominent citizens. It includes 130 historical photographs. William S. Kent donates land for KSU, accepted by State of Ohio. Kent State College becomes University.